Last week we shared a blog post about caring for mums. Kelly Stover asked if mums can be grown indoor in a container. Sure! They can be grown inside; however, the answer to that question is actually a bit complicated. While not a typical houseplant, mums can add a seasonal splash of color to your décor, but there are a few considerations you need to make. While mums can be grown indoors, they can be a bit tricky to keep looking presentable. For this reason, I tend to treat them the same way I would treat a poinsettia at Christmas. They’re a beautiful living arrangement that will outlast cut flowers. I’m just not committed enough to nurse them along. …. That’s just me though. There are some people who accept the challenge of growing mums indoors. Editor's Note: We just wanted to clarify that we sell our fall mums as an outdoor plant, and you'll get the best results growing them there. Plant mums in containers with fresh, well-drained potting media. Mums like moist, but not overly wet soil. Place them in an area that provides bright, but filtered light. When growing mums indoors, as opposed to outdoors, direct sunlight can harm them. Mums are phototropic, meaning they rely on day length to trigger blooming. Reduce the amount of light the get to below 10 hours per day to trigger blooming. Keep it cool. Mums like a nighttime temperature range between 60 to 70 degrees Fahrenheit. Though they will be fine with warmer daytime temperatures, cooler temperatures will keep the looking happy and healthy. Although some mum species produce pyrethrum, a naturally-occurring pesticide that paralyzes insects that come into contact with it and is one the strongest insecticide allowed under National Organic Standards guidelines, there are still some pests willing to have a mum meal. Wash aphids off of mum plants with a soap mixture of 2 teaspoons of mild detergent per gallon of water, suggests the University of Missouri Extension. Saturate plants with a low-toxicity insecticide, such as an insecticidal soap. In the case of heavy infestation, prune or pinch off heavily infested plant parts. Another common pest is the leafminer. Look for the tunnels they create as they feed into plant tissue. Look below the plant for leaf drop, which often occurs as a result of damage. Remove with pruning shears and destroy plant material affected by leafminers, such as mined leaves. Apply neem oil to plant surfaces to kill leafminers, making sure to thoroughly saturate the mum plant. 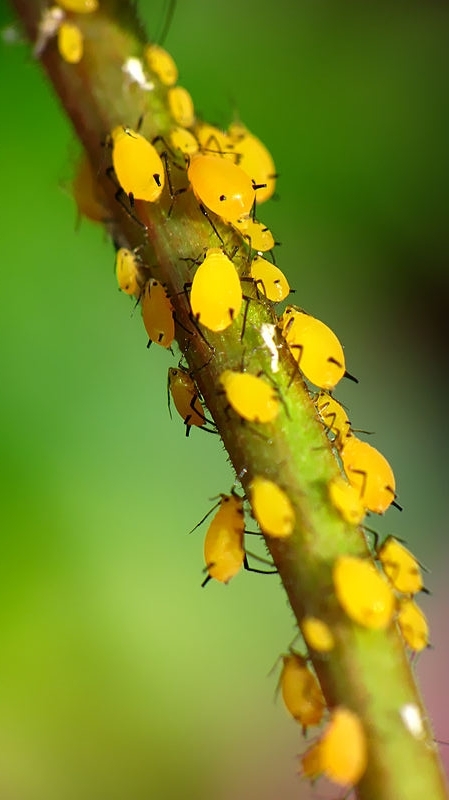 Plants rarely suffer severe damage as a result of these pests.